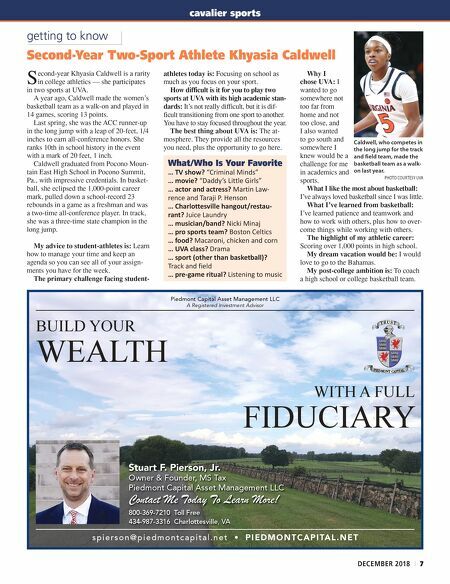 Cavalier Corner is the publication just for UVa sports fans! cavalier sports W hen it was announced on May 6, 2018 that Braxton Key was transferring from Alabama to Virginia, Wahoo fans rejoiced. Key was not only recruited by head coach Tony Bennett, but he is also the nephew of UVA Hall of Famer Ralph Sampson and friends with third-year guard Kyle Guy and redshirt third-year forward Mamadi Diakite. Men's basketball had further reason to cel- ebrate Oct. 22 when Key received a waiver from the NCAA that granted him immediate eligibility to play in 2018-19. At Alabama, Key earned All-SEC Freshman team honors after averaging 12.0 points and 5.7 rebounds in 34 games. In 2017-18, after miss- ing the first 10 games of the season with a knee injury, he averaged 7.0 points and 5.3 rebounds in 26 contests for the Crimson Tide. Key said his relationships with the players and coaching staff have helped him settle into his new home in Charlottesville. "I've always had a relationship with the coaches here and Kyle Guy and Mamadi, who gave me the inside scoop from the player side," Key added. "You can hear a lot of things from the coaches, but it's different when you have a relationship with a player. "Everything they would tell me and everything the coaches would tell me was on the same page. It just felt like home. I took my visit and it's been great ever since. I'm really enjoying it here." Virginia's coaches and players are enjoying having Key around as well. Six games into the season, the 6-8, 225-pound guard was averag- ing 5.8 points per contest, and was either ranked or tied for second on the team in offensive and defensive rebounds (nine and 23, respectively), blocked shots (three) and steals (11). Those were the type of numbers Bennett was hoping for when recruiting the mobile Key. "He brings versatility," Bennett said. "He's a physical player that rebounds. He was good on the glass, and he's versatile and brings physical- ity and awareness. I thought that was important." The defensive numbers are interesting con- sidering this is Key's first experience with the Pack Line defense. "I didn't know it was this difficult," Key admitted. "I made a couple mistakes in the last game. We watched it later in practice. Some people would say it's easier watching it on TV. "I think it's difficult, but I'm getting it. The guys give me little tips here and there through- out practice to help me." Key said he has adjusted to Charlottesville and the university, and on the floor he is focused on finding how his skill set fits with the team. "I'm finding my role within the team, whatever role it is," Key ex- plained. "The coaches kind of want me to do a little bit of everything. I just want to help the team win and be successful. "At the end of the day, it's just about winning. Taking one game at a time and being a leader. That's one thing I think we need this year. A lot of returning guys talk a lot, but as an upperclassman, I can add my voice also and the coaches want me to open my voice more." — Greg Waters 6 CAVALIER CORNER behind the scenes Transfer Braxton Key Granted Immediate Eligibility Key, who transferred from Alabama to Virginia, averaged 5.8 points, 5.3 rebounds and 1.8 steals per game during the Cavaliers' 6-0 start. PHOTO COURTESY UVA JACK MUELLER • WRESTLING The third-year All- American is redshirt- ing this season, which allowed him to focus on freestyle wrestling after winning the U-23 U.S. World Team Trials this summer (college is folkstyle, which differs in scoring and rules). It paid off for the Dallas native, who placed fifth at 57 kilograms (125.7 pounds) at the U-23 World Champion- ships in mid-November. After a 13-3 victory, Mueller fell to the eventual world champion, 9-4, and then ad- vanced to the bronze medal match with a thrilling 16-15 victory. A comeback for third fell short, but Mueller was still able to make an im- pression on the world stage during his year off. HEATH MILLER • FOOTBALL The Cavalier legend was among the induct- ees for the Virginia Sports Hall of Fame Class of 2019. The native of Honaker, Va., won the Mackey Award as the na- tion's top tight end in 2004, capping an incredible college career that resulted in a first-round selection during the 2005 NFL Draft and an 11-year career with the Pittsburgh Steelers, where he won a pair of Super Bowl titles and earned two Pro Bowl nods. His record-setting ways began early on at UVA, when he notched the confer- ence mark for touchdown catches by a tight end with nine as a redshirt first- year in 2002. He eventually set ACC records for career receptions (144), yards (1,703) and touchdowns (20) by a tight end. JUAN THORNHILL • FOOTBALL The fourth-year safety from Altavista, Va., was one of three Cavaliers named first-team All- ACC. It marked the sec- ond conference honor of his career, following his third-team selection a year ago. Through 12 games, he led the bowl- bound Cavaliers with 92 tackles and five interceptions, while also breaking up six passes. His five picks rank No. 3 in the ACC and No. 4 in the nation heading into December. He was named the Walter Camp Na- tional Defensive Player of the Week af- ter making six tackles and intercepting two passes, one of which he returned a career-high 62 yards, in a 16-13 vic- tory versus then-No. 16 Miami Oct. 13. 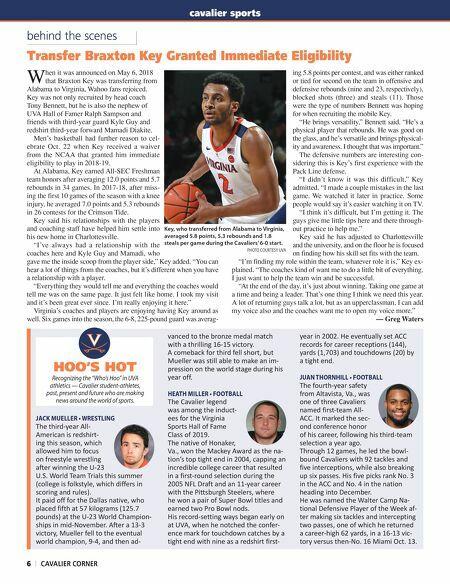 HOO'S HOT Recognizing the "Who's Hoo" in UVA athletics — Cavalier student-athletes, past, present and future who are making news around the world of sports.